Cyclic Law – Funerary Call, Beyond Sensory Experience and Parhelion & Zac Keiller new releases – Chain D.L.K. Pre-Orders for 3 new titles are now being taken. 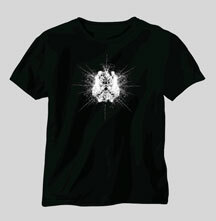 We also have 2 new T-Shirts designs begin printed. Official release date is Novemeber 26 2013. It is with great honor that we welcome Canada’s unique and by now legendary Black Ambient act Funerary Call to our family. For this new opus Harlow Macfarlane found inspiration from personal interpretations of the Tree of Death and what is considered to represent the reverse or occult side of the Tree of Life, a diagram of the negative forces or Qliphoth (Hebrew, Shells) assigned to each Sephiroth. They represent the counter-forces of the ten divine emanations as described by the ancient Qabalists and the paths or tunnels that connect to these infernal realms and the various demonic forces that inhabit them. The constant shifting of sounds and tones are a metaphoric reflection of these various “shells” and chaotic entities. Built as one continuous piece with various chapters, this new album serves as a vehicule for delving deeply into the shadow side. Artwork by Dehn Sora. 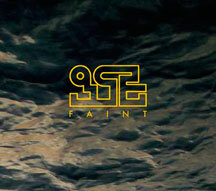 With their new full-length album “Faint” Beyond Sensory Experience are back revisiting ghosts of the past to create memories of the future. 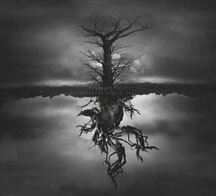 Eleven divergent studies of transformation elements result in BSE’s most complete and intriguing album to date; full of liquid dark ambient soundscapes, salient samples and entrancing melodies. Hold your breath and close your eyes, when winter turns to water, day turns to Faint. 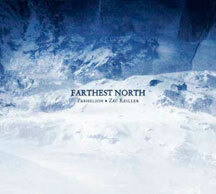 Farthest North is the result of a musical collaboration between Canada’s Parhelion and Australian sound artist Zac Keiller. The idea originated while they both were treading similar thematic ground with their individual projects, mainly, that of using the far north as an artistic muse. The end result of their effort is a record that, through the prism of its authors, focuses on capturing the essence of this extreme landscape, eschewing the romanticized and instead focusing on the stark, cold immensity and volatility of a place located at the ends of the world. Teetering between the hauntingly sparse and the occasionally chaotically dense, the music attempts to mirror the landscape’s primitive elements through its sonic interpretations, weaving together both a personal and impersonal narrative drawn from the geography, atmosphere and psychical character of one of the most forlorn realms known to men. Comes with a bonus DVD of a special collage of the album tracks set to abstract nordic landscapes for a uniquely immersive audio visual experience. White Ink on 100% cotton Black T-Shirts. 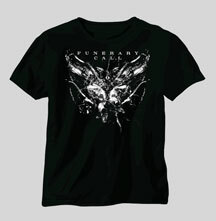 Front print with Funerary Call text logo and “The Mirror Reversed – Part 1” album artwork. Front print with Treha Sektori logo artwork. Back print with Treha Sektori text logo.